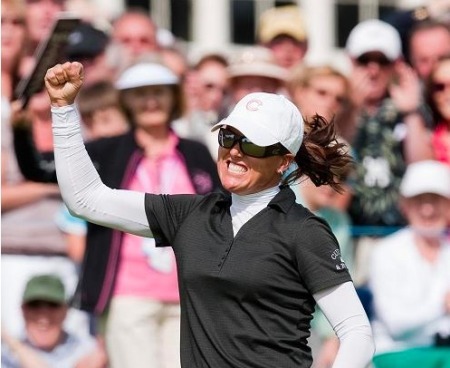 Big-hitting Martina Gillen fired a superb 69 to lead the Irish challenge and leave the Maguire twins in the shade in the AIB Ladies Irish Open at sun-kissed Portmarnock Links. The Dubliner, 27, had five birdies and two bogeys to trail leaders Maria Hjorth of Sweden and Julie Greciet of France by just two shots on three under par. “I’m delighted because I have never played well around here,” said Gillen, who hit 15 greens in regulation and holed a 45 footer for her fifth birdie of the day at the par-three 17th. “A win? I don’t know. I’m just looking for a good solid round tomorrow and then take my chances on Sunday." Just two of the 10-strong Irish contingent broke par with Carlow rookie Tara Delaney sharing 11th spot after a 70. Leona Maguire was the best of the 14-year old Cavan twins, firing a two over par 74 to beat her playing partner and four-time major winner Laura Davies by a shot and tie for 46th place with Royal County Down amateur Danielle McVeigh. “I haven’t got a crystal ball, but who knows, they might be the best players in the world in ten years time,” said Davies, who struggled off the tee. “All the ingredients are there. You can’t not be impressed. Fabulous. Leona hits it very straight and pretty long too - and she will get longer and longer as well. Leona was delighted with her opening effort and another 74 today will see her comfortably make the halfway cut. Hjorth and Graciet have a one stroke lead over six players including two time Solheim Cup star Gwladys Nocera of France and England's Melissa Reid, who is third in the Ladies European Tour money list. Italy’s Diana Luna cruised to her first win for five years in the fog - delayed AIB Ladies Irish Open at Portmarnock Links. But it could be the last time the event is held at the north Dublin venue with organisers seriously considering a move to Solheim Cup venue Killeen Castle next year. Overnight leader Hazel Kavanagh slipped six shots off the pace entering the final round of the ABN AMRO Ladies Open in Holland. The Dubliner, who led a Ladies European Tour event for the first time in her career following an opening 68, followed up with a three over par 75 to slip back to tied 17th on one-under. Martina Gillen is just four shots off the lead after the opening round of the Lalla Meryem Cup in Morocco. Sixteen year old amateurs Lisa and Leona Maguire made the cut with ease as Norway’s Suzann Pettersen shot a course record 63 to grab a share of the lead entering the final round of the Ladies Irish Open at Killeen Castle. Norway’s Suzann Pettersen fired an stunning final round 64 to romp to a six stroke win at the Ladies Irish Open supported by Fáilte Ireland at Killeen Castle. The world No 3 finished ahead of Spain’s Azahara Munoz on 18 under par as she followed her course record 63 on Saturday and eight under par closing effort.